Chop saw - It has had the motor burnt out and a new handle, but after about 25 years it's having a easy time of it now. These cut off saws all use the same size friction blades. 355 x 3.0 x (centre hole dia.). There is a larger size, but this is by far the most popular. They gradually wear down as you are using them, until they are too small to cut. Heed the warnings on the disks. You may come across 3.2mm thick blades. I did, they were cheaper, I burnt out the motor. Not cheaper after all. Stick to 3mm. When you are cutting flat bar, set it in the clamp vertical, that is cut through the thin way. They complain long and hard when they have to cut through it flat. It's hard for the blade to clear the swarf. With angle steel, I set it like this ^ (an upside down "V") so there is no flat to cut through. If you are pushing it a bit much and you see dust coming off the blade, back off, you are wasting the blade. What you should see is plenty of bright sparks coming out the back, and hear the revs not a lot less than free idle speed. 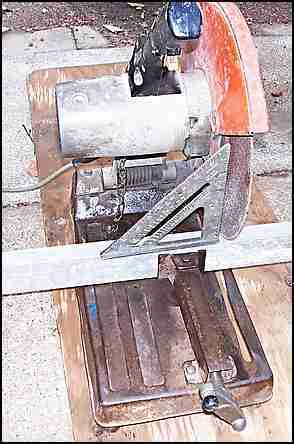 If you set the chop saw up directly on concrete, put a bit of cement sheet, iron, even wet ply (as long as you keep your eye on it) underneath it, as those sparks will leave a permanent stain on the concrete. Likewise protect walls or windows if you are close. The photo here is of my Makita 355mm (14") cut off saw. This chop saw is without a doubt a hardworking machine. It has NOT been treated with affection and consideration like some of my carpentry tools. My chop saw is noisy, dirty, dusty and I know I am in for a hard day when it gets set up on site. It has had the motor burnt out once and it has fallen off a scaffold and smashed the handle. This steel cut off saw is at least twenty five years old, and still going strong. You can buy a larger ones that have 410mm blades. If you are thinking of getting a larger one I would check on the availability and cost of the larger blade. In any of these tools like grinders and friction saws it is the cost of the consumables that is by far the major expense in the life of the machine. After a saw has been used for a while, metal and disk residue builds up on the inside of the steel guard. You will see it when you are changing the disk. I usually give the outside of the guard a whack with a hammer to dislodge it. (When it is switched off, of course). I'd sooner get rid of it than take the chance of it flying off at speed when I am cutting. A lot of times with this chop saw, because of the length and weight of the material I want to cut, I have to work with the saw on the ground. I put something flat and solid under the saw and then use packers to support the steel. I check the setup, with a square to test that the face of the disk is square off the steel, just in case the ground is sloping or my packers are wrong. I don't mind if the packers to the right are a bit low, as this allows the cut to open slightly as I cut. Never set up your packers, (or a bench for that matter), that allows the steel to sag in the middle, this would cause the chop saw to bind and then jam. To get a really accurate cut, mark the material with a fine pencil and set it in position with the clamp nipped up lightly. If your mark is not fine enough or hard to see, you can put your tape measure on the end of the material and bring it under the disk. Lower the disk almost to the tape and sight down the face of the disk to the tape. Sight down the surface of the disk that is going to do the cut. Chop saw - sighting along the blade to get an accurate cut. In the photo above if I move my eye a touch more to the right I should see that my size of 1520mm is dead in line with the cutting face. If the piece that I want is on the right of the disk, I would sight along that side. For heavy material that is hard to move, nip the clamp lightly, adjust by tapping the end of the material with a hammer until it is spot on. 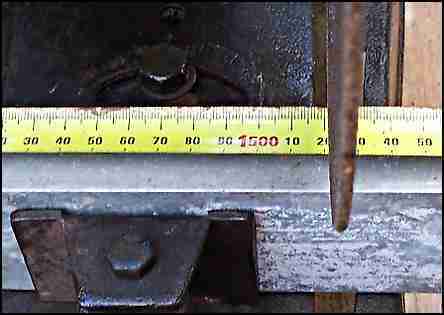 If it is long stuff, I often tap the saw with the hammer to get it up to the mark. (Like I said, it's had a hard life :-) Tighten up the clamp and go for it. This way of using your tape under a cutting blade and sighting down the blade is common on timber saws as well. Usually when you are setting up a stop on a bench to cut many pieces the same length. For marking out on black steel I use a sharp piece of French chalk. As usual use the recommended safety gear. It is a funny thing with safety stuff, you start off learning it and doing it, then after a while a period of overconfidence sets in. Then you have a near miss and you pull yourself back into line. Many times I have done a quick cut with this saw and instead of searching for my face guard, I turn my face to the side and do the cut. Stupid! Don't do it.